For years, I have encouraged students to use our makerspace to create and make for others, notably at holiday time and Mother’s Day. But there are also those situations where the motivation to make for others is inspired by more unfortunate events. Every seasoned librarian has had a patron share a sad story of a grandparent or dear aunt who recently passed. It was due to situations like these that our Grief and Bereavement LibGuide was created as an action guide to compassionate making for our community and for others. One of my favorite sayings is Acta non verba — Deeds, not words. Sometimes we need physical action to alleviate our suffering — we just have to do something. Through compassionate making activities like those included in the guide, we can inspire our students to do good rather than focus on the injustice or suffering in the world. Two years ago, the need for compassionate making hit home for our community. We were all affected when we were blindsided by the tragic death of a recent graduate. We were at loose ends and needed to come together somehow to overcome our shared grief. 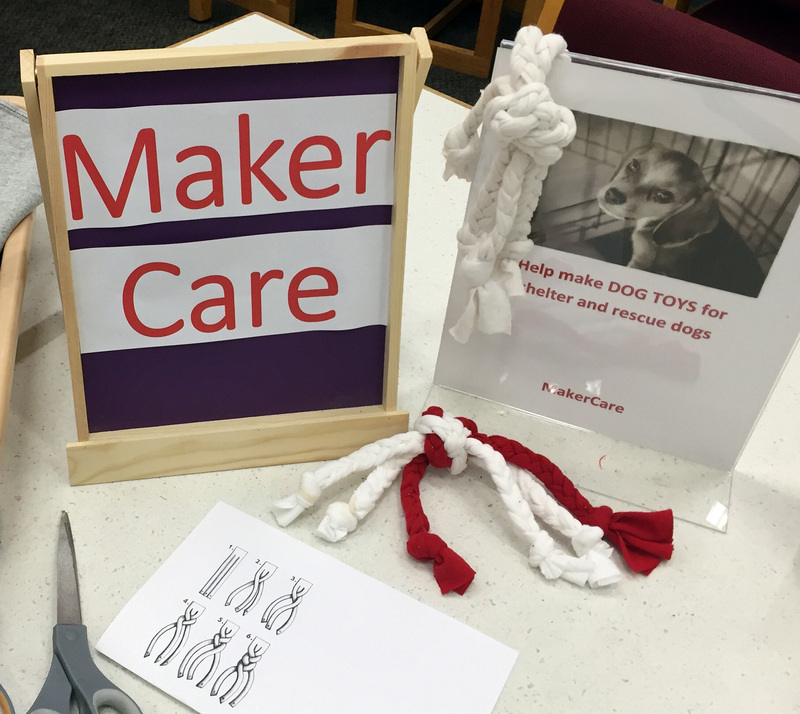 While librarians should not take over the role of school grief counselors, we are often on the front lines, and using our makerspace proved invaluable for helping to alleviate our grief and stress. 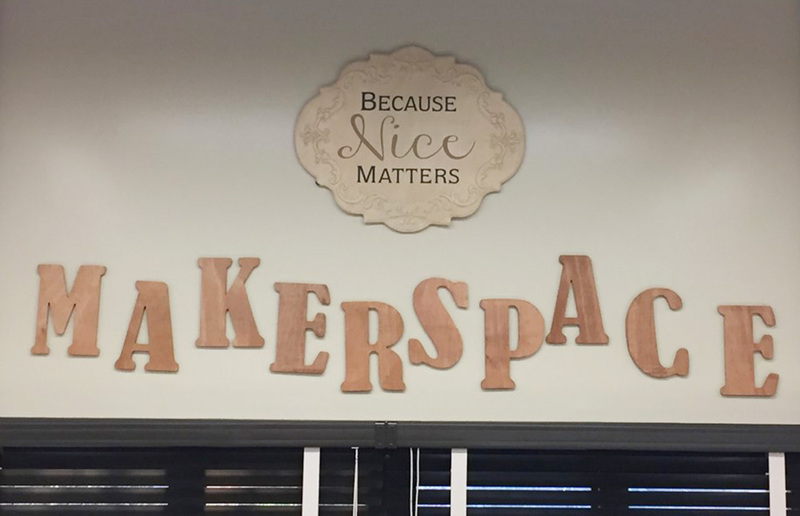 This was a turning point and what led to the expansion of compassionate making and the MakerCare program at our school library makerspace. Our MakerCare program features a series of compassionate maker projects with a focus on empathy and social action. If students or staff members see a need in the community, they are encouraged to use the space and supplies to address that need. We collaborate to bring together the necessary resources, people and supplies to accomplish the task. We’ve developed a comprehensive, inclusive program, where all students can participate regardless of language skills or learning disabilities. MakerCare is available throughout the school day and after school. Students can participate with a class, a club, a friend or individually in this open and flexible program. 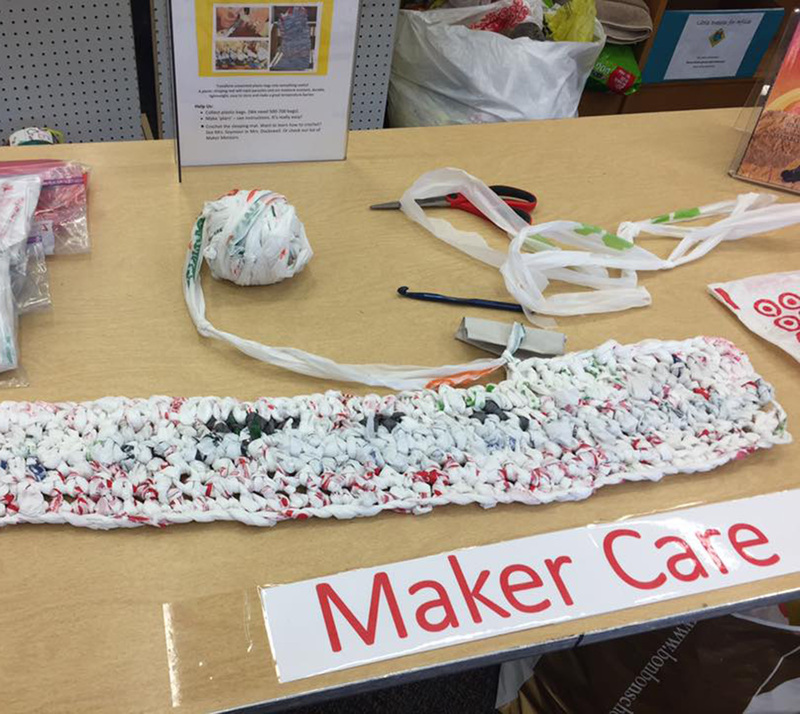 Doing for others, expressing empathy, and showing concern through making is highly encouraged in our library; therefore, our MakerCare program is a community-service-based model that teaches teens about social action and civic engagement. 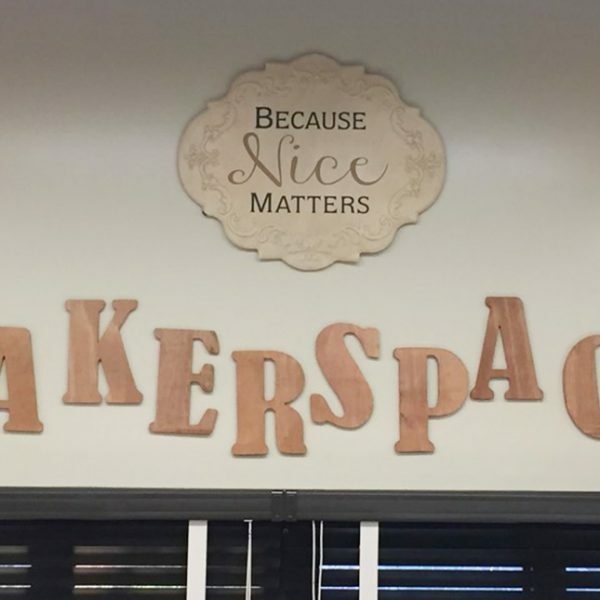 The participants strive to make the community and the world a better place through compassionate citizenry and use our school library makerspace to create items that benefit agencies and organizations in need of assistance. My goal is to inspire, to model, to assist and to enable my students to serve by making a difference in their community. We encourage students to not only be the change but to also make the change they wish to see. One of the cornerstones of makerspaces is creative problem solving, so we take that creative thinking and apply it to real-world problems. For example, animal shelters across the country have dogs and cats sitting in kennels awaiting their forever homes. While the dedicated shelter workers strive to interact with each animal in their care, time and other duties are formidable foes. Here’s where compassionate youth can play a role. 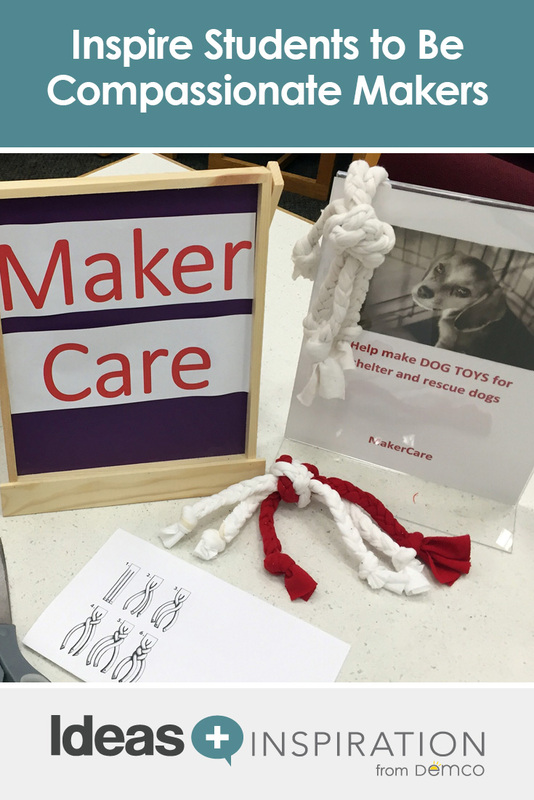 In addition to holding a supply drive to collect pet food, newspapers, old towels and other needed items, your makers can get to work creating delightful cat and dog toys. The supplies help alleviate the overstretched budget of the shelter, and the toys help occupy the animals while awaiting human interaction from staff or an adoptive family. So how can you facilitate and foster compassionate making? Easy. You already have supplies in your makerspace — scissors, glue, etc. — now all you need are a few more items, many of which can be upcycled for your use, such as T-shirts, pillowcases and plastic bags. Upcycling not only benefits the earth, but it is also advantageous to your budget. Even with minimal funds, it’s possible to serve. It’s wonderful to help those in need globally; however, if you don’t have the funds to ship donations overseas, act locally. There are those in our communities and even our schools who need help. Where can you make a difference? Your makers can show compassion at school, in the community, globally and toward the environment. With limited library budgets in mind, the projects on our Compassionate Maker LibGuide and the examples below are simple and low cost. However, more costly compassionate projects are just a 3D printer away! If your funding allows, try making a prosthetic limb or other assistive devices for the disabled. The inspiration for MakerCare came from the group project of making memorial buttons to honor our student who passed away. This small act had a significant impact on students and staff at our school. Since then, the program has blossomed, and we’ve focused on more projects for our school community. 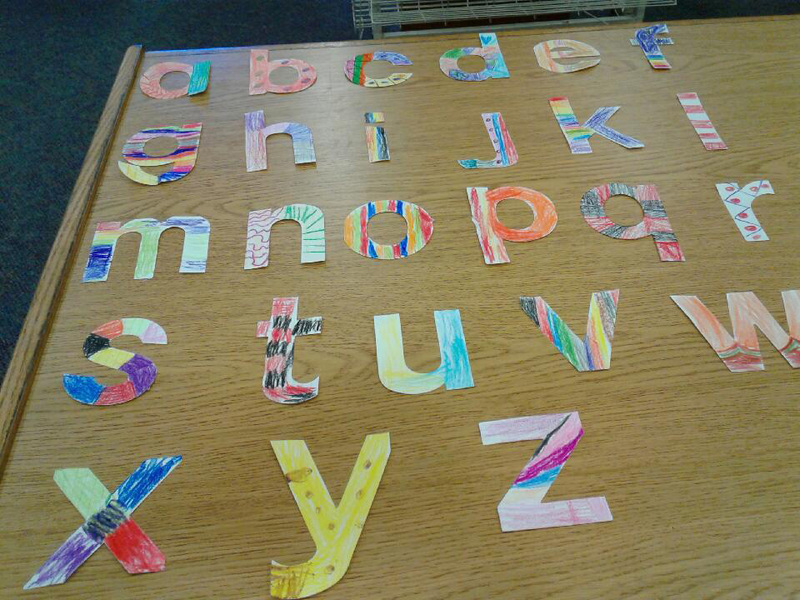 For instance, our elementary students made letters for the Fiction section of their school library to help classmates find books within the shelves—a simple and effective shelf-marker project for the library. 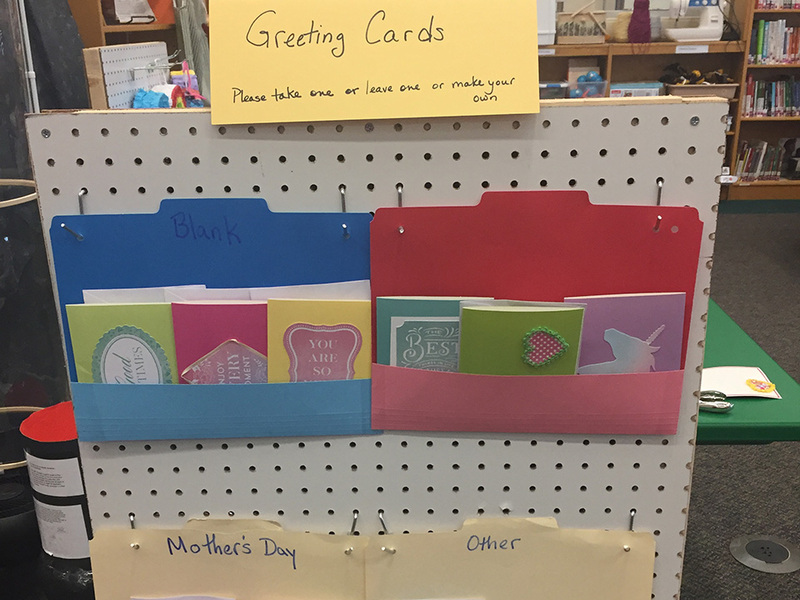 Recently, we created a greeting card center where students can make cards for themselves and for others. The extra cards are placed on display for anyone to take and use. Some of the cards are written in other languages to make the center inclusive of our English Language Learners. Dog toys for animal shelters can be made from donated T-shirts. All you have to do is cut them in strips and braid. 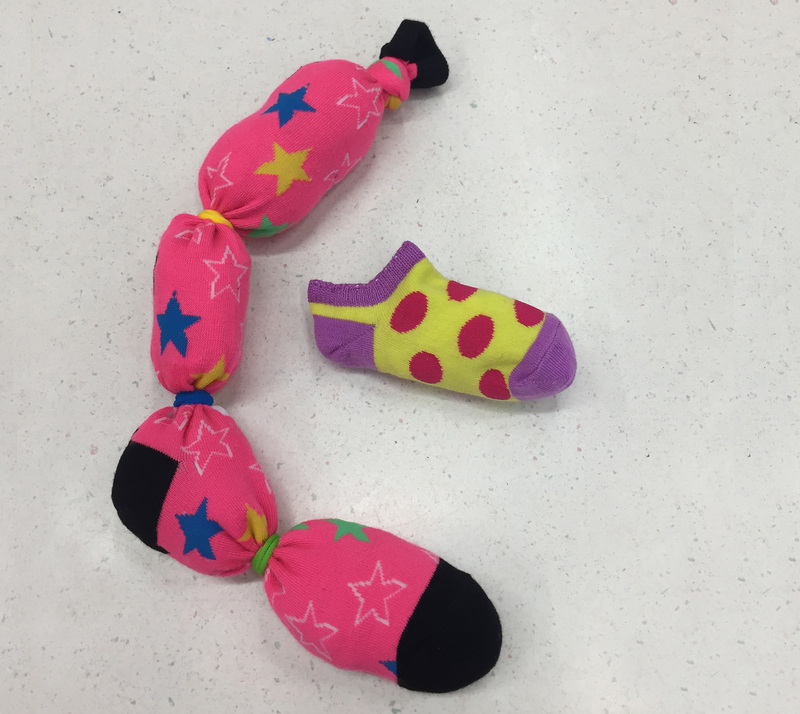 For our cat toys, we upcycled baby socks, added a little poly-fil and catnip and then sewed them up. Our local animal shelter is less than a mile away, so the students and I were able to drop off more than 100 dog and cat toys. You can also get out your fabric scraps, scissors, needle and thread and “sow” some kindness! 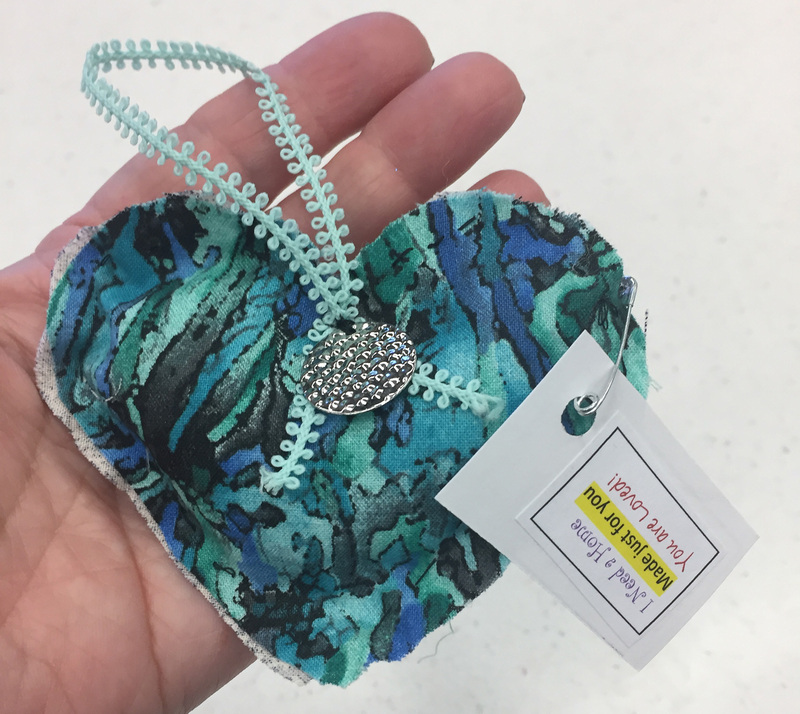 In celebration of Random Acts of Kindness Week, we joined the I Found a Quilted Heart program. Handmade hearts were left around town for random people to find, bringing some joy to their day. Our Little Dresses for Africa project was a collaboration with a family and consumer sciences teacher at our school. 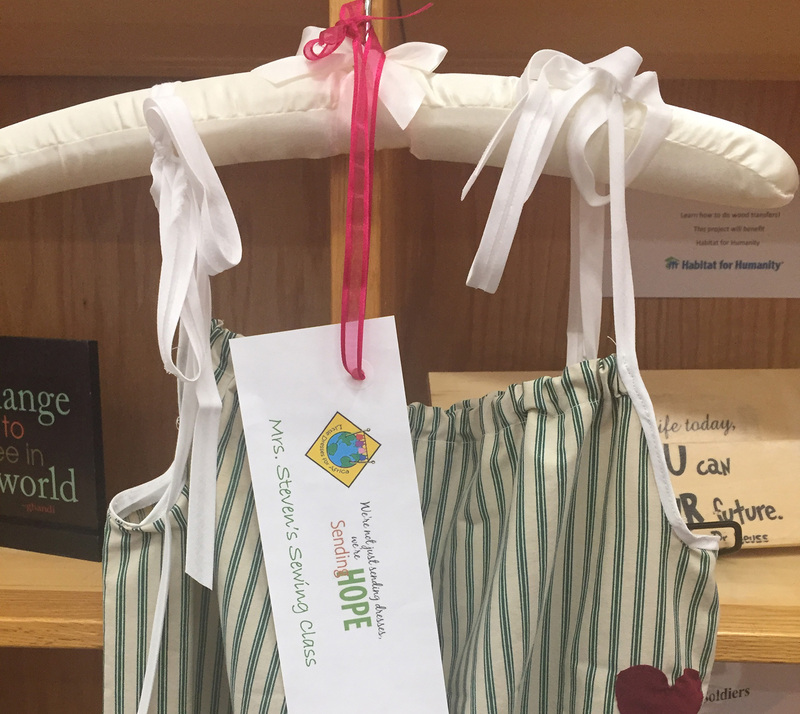 We collected donated pillowcases, and our sewing teacher, Heidi Stevens, worked with students to create and send these adorable dresses off to African children. Too many plastic bags? Upcycle them for a purpose! Plastic yarn, or plarn, can be used to crochet any number of items, including sleep mats for the homeless. This project takes approximately 500–600 plastic bags out of the garbage cycle. Need a smaller, less intensive project? 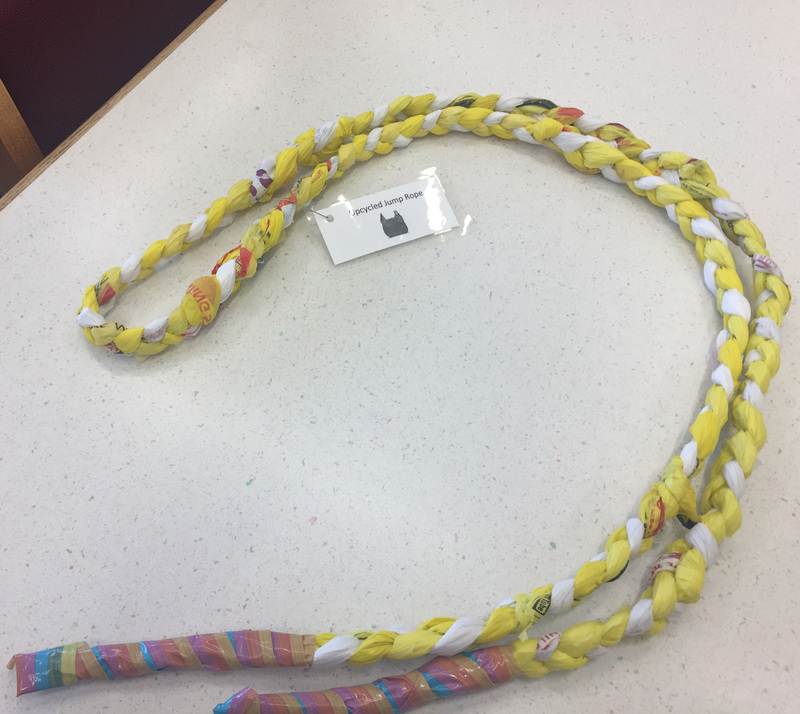 Try making jump ropes; we donated ours to an elementary school. More than once I’ve had a librarian contact me to say that the local animal shelter would not accept her donation of student-made dog toys, and she was wondering what she should do. I see this on social media crafting groups, too: “What can I do with (fill in the blank) items that I made? My local hospital won’t accept them.” I cannot stress this enough: don’t start a project until you confirm there is a need. Furthermore, if there is a need, find out specifically what the organization wants. For example, our local Habitat for Humanity office doesn’t need or want handmade Welcome Home signs. I know this because I called and spoke with their volunteer coordinator and we worked out an alternate project. Teens are social and want to work with friends. Volunteering opportunities need to be accessible, with no car needed. Furthermore, teens want to serve close to home, but not at home. Teens can’t always commit to long-term projects, so programs with one-time commitments or a come-and-go-as-you-please model, as well as short engagement times, such as five minutes, one hour, or half a day, fit their highly scheduled lives better. These results make the school library a perfect gateway to service. We all can have a small part in making a difference in the world. For as Helen Keller aptly said, “Alone we can do so little; together we can do so much.” Through innovative thinking and problem solving, today’s youth can create items to contribute to making a better world by learning to take care of the least-advantaged members of society. So, harness your students’ philanthropic power by modeling compassion and empathy—for you are the change agent influencing today’s youth.